William Jefferson "Bill" Clinton (bibi William Jefferson Blythe III, August 19, 1946) je Aare orile-ede Amerika 42ji lati 1993 to 2001. 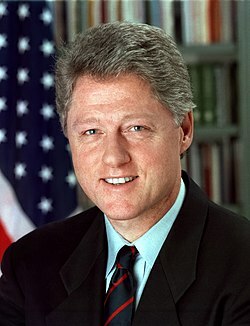 ↑ "Biography of William J. Clinton". The White House. Retrieved October 29, 2008. Àtunṣe ojúewé yi gbẹ̀yìn wáyé ni ọjọ́ 16 Oṣù Kẹrin 2018, ni ago 14:22.